Safford is centered on the US 191-US 70 intersection at the edge of the vast San Simon Valley in southeast Arizona, beside the Pinaleno Mountains which rise to 10,713 feet (Mount Graham) a few miles south. The foothills of the much more extensive White Mountains are within sight to the north, crossed by US 191; the city lies along a scenic section of this highway known as the Coronado Trail. 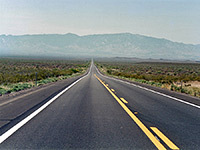 Despite the generally high ground in most directions, Safford has a low elevation and enjoys a hot desert climate, with summer temperatures often exceeding 100°F (38°C). The city center occupies a dozen or so blocks between 8th and 3rd avenues, 8th and 4th streets, lined by many old buildings, restaurants and shops, though a fair number are unoccupied. Several larger stores are found along US 70 to the west, about half way to the adjacent community of Thatcher. Regarded by many as the best hotel in town, the Quality Inn occupies a quiet and spacious site on the east side of Safford along US 70, in a generally rural neighborhood bordered by undeveloped land to the north. The hotel is less than a mile from downtown Safford, and is close to several restaurants & shops. Amenities include free full breakfast, a good sized indoor pool, hot tub, fitness center, gift shop and meeting space. All 102 rooms are very clean & comfortable, and equipped with a microwave & refrigerator; some have a private balcony. The hotel also provides several suites with a DVD player, whirlpool bath, and separate sleeping/living areas. To the east, US 191 forks north after 10 miles and enters the White Mountains - the most scenic section of the Coronado Trail. One mile west of Safford town center, the Best Western Desert Inn is an older, two floor motel of 70 exterior corridor rooms (some containing a microwave/refrigerator) - built in three wings around a central parking area plus outdoor pool - though all accommodation is regularly upgraded. The hotel has quite a rural location, on the south side of US 70, with fields just to the north and mountains on the horizon yet is within half a mile of various shops and restaurants in Safford. Pets are welcome, and the inn has other amenities of free continental breakfast, guest laundry and basic business services.